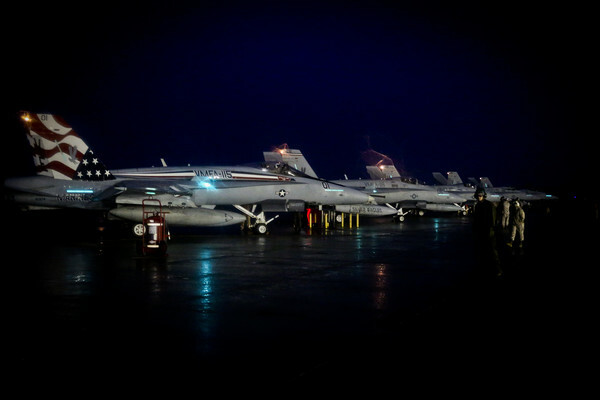 BEAUFORT, Sc — Marine Fighter Attack Squadron 115 departed Marine Corps Air Station Beaufort April 9-10 in support of combat operations overseas. Over the past months, the squadron has been working longer hours to prepare not only the aircraft, but also their minds for the fast-paced tempo of a deployment. The squadron was given the chance to spend time with their families the day of their departure. The United Services Organization provided food for the Marines, Sailors and their families. During the weeks leading up to VMFA-115’s departure, the Silver Eagles worked with the rest of Marine Aircraft Group 31 to prepare the aircraft for this deployment.